Gah this series! It is killing me how good it is! 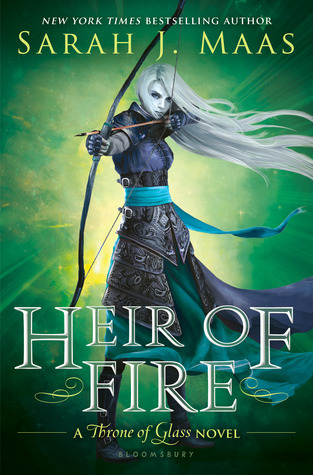 Heir of Fire started slow for me, mainly because I couldn't remember what had happened in the second book (Thank you Recaptains!). It took me a few chapters to get all the characters resorted out (especially since Celaena is somewhere new and meets all new characters. Celaena is so fierce. She is a "take no prisoners" sort of girl and I love how much we dive deep into her psyche in this book. We learn the truth about Celaena's entire history and boy is it dramatic. I have been so crazy about Celaena and Chaol this entire story, but to be honest.... someone new is on the scene, and although there is no love triangle that I can see- wowzers is that a deep relationship. Look I will be honest, writing reviews for books that I am absolutely mad about is so hard- I don't want to give anything away! So I will leave it at this. If you haven't started this series yet- go get a cone of shame and put it on your head. It is that good.